Spray a nonstick pan with coconut oil cooking spray. Heat over low-medium heat, no hotter. Add mushrooms and spinach to pan, spreading evenly in pan. Cook the veggies down. Mix the eggs and egg whites in a bowl. 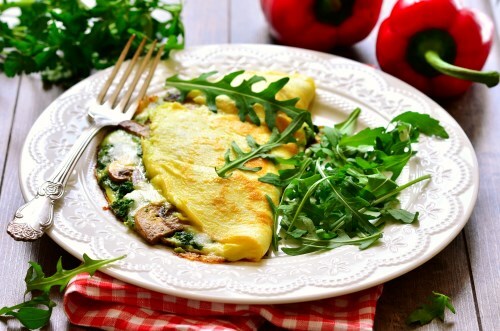 Slowly pour egg mixture over mushrooms and then sprinkle with spinach. Cover with lid. Let sit for about 10 minutes. Occasionally check to see when eggs are no longer runny on top of the omelette. When set, tip omelette onto plate while folding in half. Sprinkle with salt and pepper to taste.